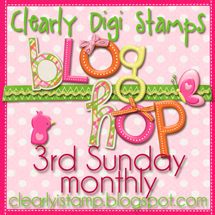 Clearly iStamp: 3 Winners from June's Blog Hop!! Oh what a wonderful blog hop we had this month! Thanks to everyone that hopped along with us! the 3rd Sunday of EVERY month! Each DT Member randomly picked one person from the comments on their blog! If your name is on the list, you will be emailed your prize by today. Congratulations! Thanks so much for the blog hop and for picking my name! What a wonderful way to start my day! Oh my goodness I see my name! Congratulations to all of the winners! Way to go!